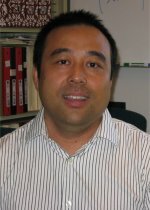 Guang Lin, a computational mathematics researcher in the Fundamental & Computational Sciences Directorate at Pacific Northwest National Laboratory, has been selected to receive a 2010 ASCR Leadership Computing Challenge (ALCC) award. The ALCC program allocates up to 30% of the computational resources at the Leadership Computing Facilities at Argonne, Oak Ridge, and NERSC and for special situations of interest to the Department with an emphasis on high-risk, high-payoff simulations in areas directly related to the Department's energy mission in areas such as advancing the clean energy agenda and understanding the Earth's climate, for national emergencies, or for broadening the community of researchers capable of using leadership computing resources. Lin's proposal "Stochastic Nonlinear Data-Reduction Methods with Detection & Prediction of Critical Rare Events" will be allocated five million processor hours over the next year on the Jaguar supercomputer located at Oak Ridge National Laboratory. The project focuses on extracting and reducing data from massive volumes of information to quantify and reduce the uncertainty in the climate models. If successful, this research project will have a revolutionary impact on how scientists analyze petascale, noisy, incomplete data in complex systems and ultimately lead to better future prediction and decision-making.